While they’re never the snappiest devices, if your Kindle is feeling sluggish—or freezing altogether—we’re here to help. Let’s look at some troubleshooting tips. Kindles are underpowered devices compared to…well, everything else. You just don’t need that much processing power to handle eBooks, and most of the time, that’s fine. But, if your Kindle is doing anything in the background, it will probably start running slowly. The only real background task your Kindle is going to be doing for any length of time is downloading eBooks. If you’re using a slow internet connection or downloading a large number of eBooks at once (or just a single large book) then there’s a good chance your whole device will feel sluggish. Wait for a few minutes until everything’s finished downloading and it should start to run much better. Note that your Kindle will also have to do some processing immediately after downloading files so it may take a minute or two after the downloads have finished for you to see the difference. Kindles are designed for small, light eBook files. They can handle PDFs, image heavy documents, and even comics, but they won’t do it as well as a more general purpose tablet. If you’re reading eBooks you acquired from non-Amazon sources, there’s a chance that they might be in a format with which your Kindle struggles. The worst example I’ve ever seen was someone trying to read a PDF scan of a book; every page was an image and the whole document weighed in at over 100MB. It’s no wonder their Kindle was having a fit. 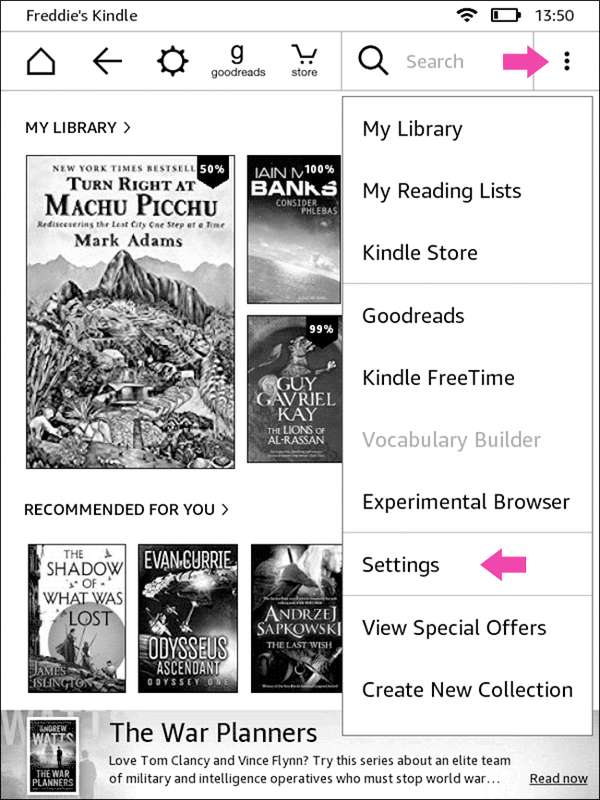 If you’re going to put different formats of eBook on your Kindle, you should use a program like Calibre to manage and convert them. You might not think about it, but you probably haven’t restarted your Kindle properly in months. When you “turn it off” after a good reading session, you’re actually just putting it into a low power standby mode. This means that if there are any crashes or the like going on behind the scenes, they can bug you for a long time. It’s also just good practice to restart your Kindle from time to time; turning things off and on again is pretty much a magic tech fix. 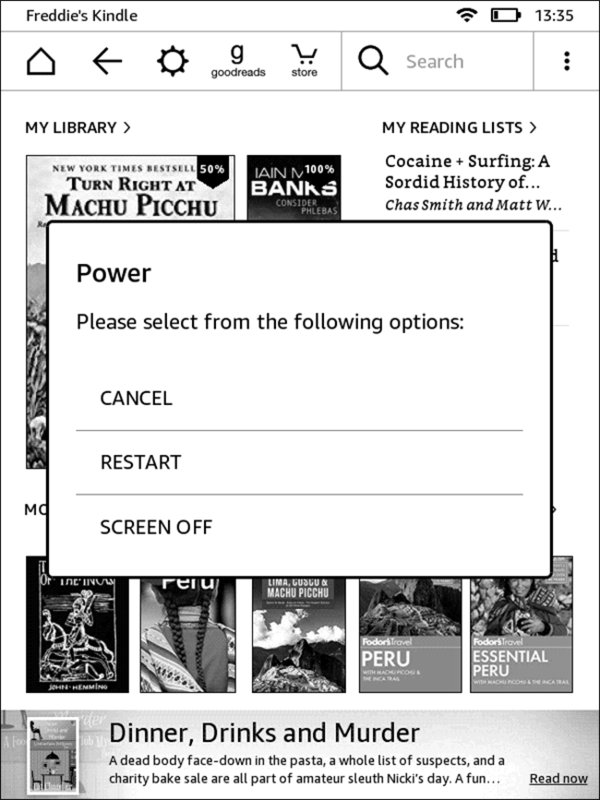 To restart your Kindle, hold the power button down for about seven seconds, and then select the “Restart” option when the Power menu pops up. If the screen has frozen and you can’t tap Restart, hold the power button down for—a comically long—40 seconds or until the screen goes black. This will also restart your Kindle. Your Kindle should automatically be updated to the latest version over the air, but sometimes that process fails. If you think you might not be on the latest firmware version, tap the Menu button, go to Settings, and then tap the Menu button again on the Settings page. 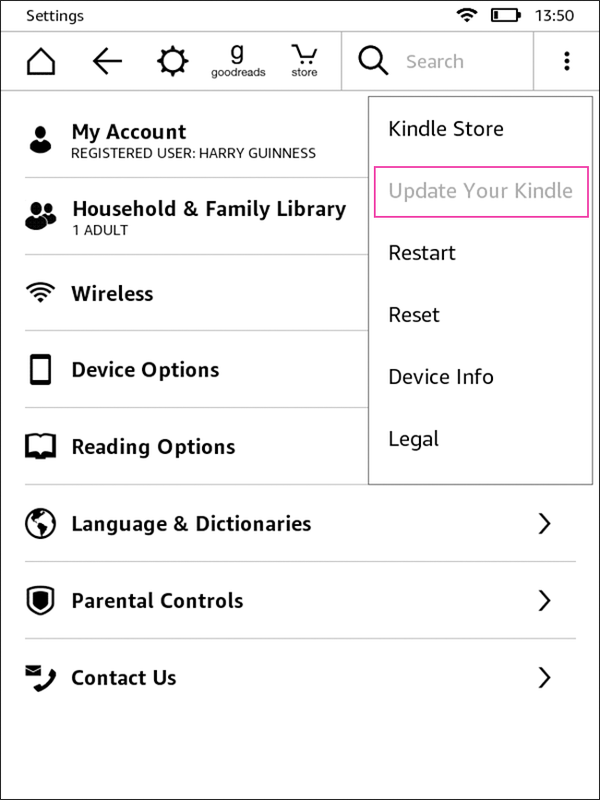 If “Update Your Kindle” is dimmed, you’re on the latest version. If it’s not, then there’s an update waiting to be installed. 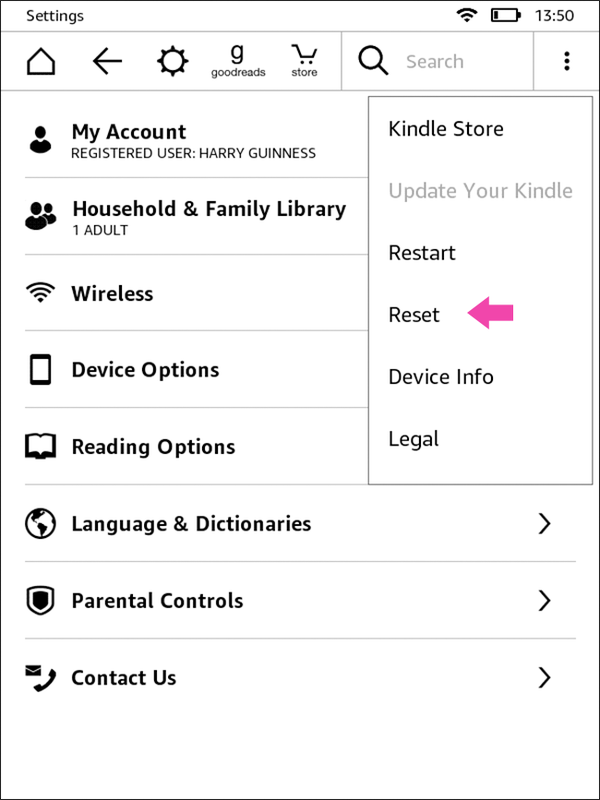 You can also try and manually update your Kindle. If none of this has fixed your Kindle, the next step is to try a factory rest. This wipes your Kindle and returns it to the state it was in when it came off the production line. If there are any bugs or weird file errors going on, this will completely purge them. Tap the Menu button again on the Settings page, and then select the “Reset” option. 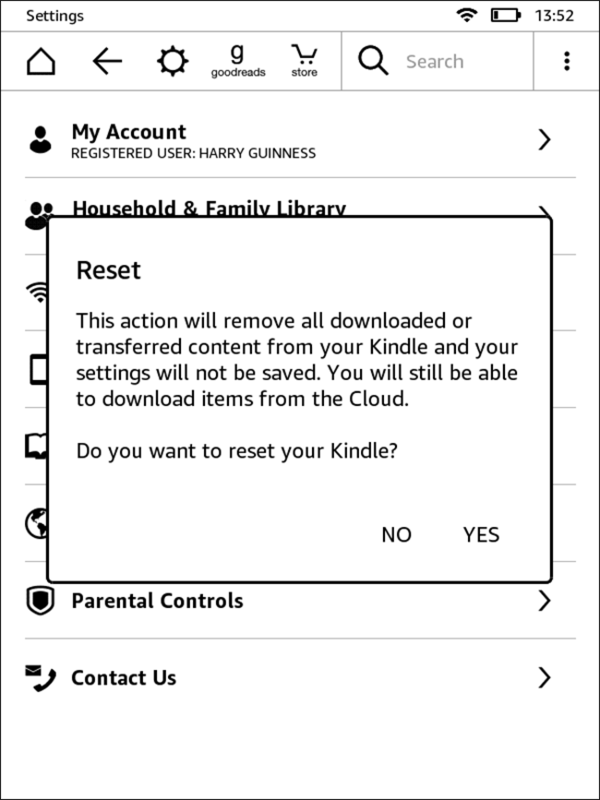 Tap “Yes” to confirm, and your Kindle will switch off. Give it a few minutes to reset and restart and then you’re good to go again. You’ll need to set your Kindle up like you did when it was new. My Kindle has been running slow the last few months and, no matter what I’ve done, it hasn’t really fixed it for more than a few days. It was only when I dug a little deeper that I realized my Kindle is one of the original Paperwhites from 2012—almost six years old. It’s no wonder that it’s not at its best anymore. The reality is that all tech products have a lifespan and that my Kindle is probably approaching the end of its usefulness. If you’re still rocking a Kindle Keyboard or similarly old device, that’s probably a big part of the problem. Consider upgrading to a newer model. I’m seriously eyeing the Oasis. If nothing on this list has fixed your slow or freezing Kindle, or you only bought it recently, then it could be a hardware problem. 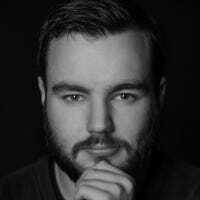 Contact Amazon support and explain your problem to them. I’ve found they’re very good about replacing faulty Kindles.